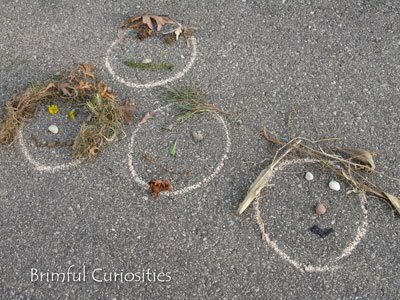 This week we're participating in 5 Orange Potatoes Children and Nature Awareness Month The Great Outdoor Challenge. I saw the challenge mentioned on Mouse Grows, Mouse Learns and thought it was a wonderful idea! That looks like a lot of fun. I might have to try that with my kids. Cute! Thanks for joining the challenge. I'll be linking you in the link list. What a fun idea! We will have to give it a try. I love this idea! Thanks for sharing. We'll be trying it out soon. Love the faces! I keep meaning to do this one early morning with the kids and then I'd like to hide and watch people's reactions as they find the faces on their way to work!